Publications promoted by the Institute of Basque Studies and those related to its activities. Conferences, seminars, multidisciplinary conferences on “Basque issues” especially aimed at the analysis, debate and reflection on the challenges of society and the Basque culture in the 21st century. A platform aimed at disseminating information and reflecting on the historical and social phenomenon of exile, migration and final return to the Basque Country. Euskaldok is an information service website based on the Institute's specialist library on Basque affairs and which has been developed to meet today's needs. 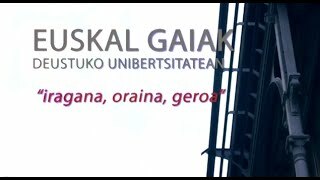 This technology platform focuses on research and teaching the pronunciation of the Basque language. It shows how the different parts of the vocal apparatus work to articulate each of the language’s distinctive sounds. Tesitek,a research team from the University of Deusto, presents the last ten years’ results of a research project whose aims, among others, are to offer the following information: the digitalised edition of the dialectal text collection that makes up Bonaparte's Archive corpus.A semi-automatic analyser of the morpho-syntactic aspects of the Basque language, both at the diachronic and synchronic levels.